Before she even hit her teens, Millie Bobby Brown was already doing great things as an actress. She played different roles in hit shows like Once Upon a Time in Wonderland before her breakout role in the world-acclaimed horror series Stranger Things shot her to fame over the rooftop. Playing the role of Eleven in the Netflix science fiction did her career a lot of good by presenting the best part of her talent to the world. Consequently, Millie got a deserved spot on the Primetime Emmy Award nomination list in the category of Outstanding Supporting Actress in a Drama Series. She was only thirteen years old at the time, making her one of the youngest stars to ever get nominated for an Emmy. More so, Millie holds the record of being the youngest person to make it on the prestigious TIME 100 list which comprises of the 100 most influential people in the world. Additionally, she became the youngest UNICEF Goodwill Ambassador following her appointment in November 2018. Beyond her on-screen appearances, Millie Bobby Brown has a very fascinating life and she has not even reached her twenties. Did you know that when the cameras are not rolling on her for a movie or show, she’s somewhere honing her skills in boxing? Apparently, she has back-up career plans just in case. More juicy deets about this vibrant young star as you read on. The English actress and model was born on 19 February 2004 at HC International Hospital in Marbella, Andalusia, Spain. Her English parents – Kelly and Robert Brown welcomed her as their third of four children. At birth, it was discovered that Millie has partial hearing in one ear, a condition that worsened over time and left her with no hearing at all in that ear after some years. When she was four, her family relocated to Bournemouth and later moved to Orlando, Florida after four years there, Bobby’s acting career gathered steam. In 2013, she guest starred in the ABC fantasy drama series Once Upon a Time in Wonderland – her debut as an actress, playing the role of Young Alice. The show is a spin-off of Once Upon a Time. The next year came with several opportunities that saw her in a starring role in paranormal drama-thriller series Intruders after which she made guest appearances in NCIS, Modern Family, and the long-running ABC medical drama series Grey’s Anatomy. Her career-defining moment was recorded in 2016 when Millie Bobby Brown landed the tasking role of Eleven in the Netflix series Stranger Things. A breakthrough role indeed, playing Eleven earned her rave reviews which came with nominations at most of the prestigious award bodies. The Netflix science fiction horror didn’t go without winning some of the awards it was nominated for, Millie took home the Screen Actors Guild Award in the category of Outstanding Performance by an Ensemble in a Drama Series alongside Stranger Things co-stars. She also scooped the 43rd Saturn Award for Best Performance by a Younger Actor in a Television Series. Other awards she has to her name include Kids’ Choice Award, MTV Movie & TV Awards, Teen Choice Awards, Gold Derby TV Awards, IGN People’s Choice Award, among others. Is Millie Bobby Brown Dating, Who is Her Boyfriend? If you thought she’s too young to be dating anyone then you got it all wrong. 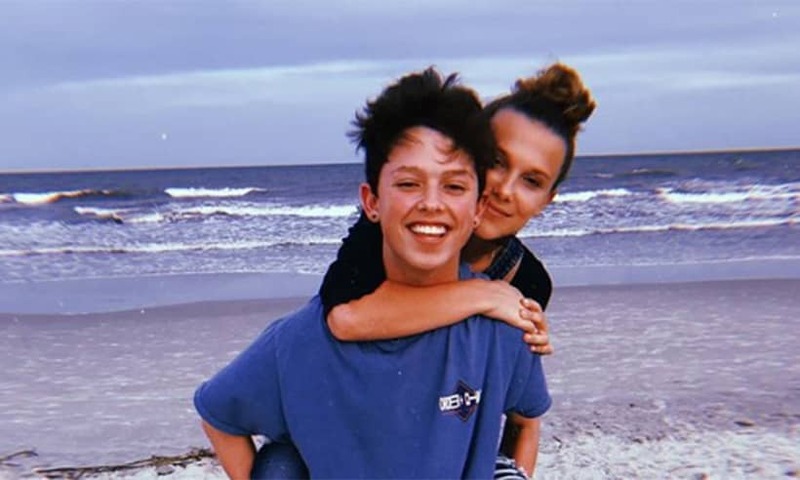 Millie Bobby Brown has been enjoying the perks of being hit by Cupid’s arrow since 2017 until her publicized relationship with American singer Jacob Sartorius came crashing in mid-2018. Nonetheless, there are rumors making the rounds about a makeup between the youngsters. The speculation began spreading early in 2019 and holds no water yet. Born in 2004, it wouldn’t be fair to conclude on the height of the outstanding actress yet since she is still experiencing growth in her body. At the moment, Millie Bobby Brown stands at 5′ 4″ which goes to say she is likely to grow into a tall beautiful woman in the nearest future. Her parents who go by the names Kelly and Robert Brown are English. They have been playing a huge role in the growth of Millie’s acting career since a scout picked her out of the bunch at an acting workshop. Her parents made sure she got to the right places to help her career grow – they moved to Los Angeles to enable her to get casting chances. The third child in the family, Millie Bobby Brown has Charlie as her brother and sisters named Paige and Ava with whom she shares a very close bond. Although they are not known to be in the spotlight, her siblings help her out in any possible way. While her elder brother takes care of her Twitter account, her elder sister manages Instagram for her.